Although I have been doing lots of extra night shifts lately and have been feeling slightly zombie-d, there have been some crafty things happening here. Crochet has become my new addiction. From initially hooking up little granny squares for pure pleasure, I progressed onto sorting them out a little and choosing nine to turn into one large square which I am intending to become a cushion. 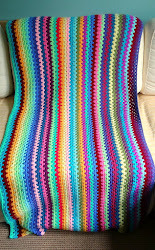 Having finished this square I am trying to decide what to do about the reverse of the cushion. Do I make another square, use fabric or try and thrift an old jumper to adapt as I have seen done very successfully elsewhere? Any thoughts or suggestions welcome! My thoughts are already turning to what I want to crochet next. I have found plenty of inspiration in both my trusty old craft books and from the internet. I took an opportuntity to pop into my local wool shop the other morning whilst it was quiet and I was on my own so that I could have a proper browse. My intention was to add some more shades to my acrylic collection so that I can make something really colourful. These are the acrylics I already had and below are the new ones. I have been playing around with different combinations but as yet remain undecided on the exact palette to use. Since this knitting and sewing obsession has been growing, I have been gathering up all the little bundles of wool/yarn squirrelled away in various parts of the house. I need to address my storage issues! Out of interest, I laid it all out on the sofa. Grannie Magpie please look away now. I was a bit shocked myself at how much there was when seeing it all together. I just need to look at this picture next time I feel an urge to buy some more. Rachael from Sew Ray Me kindly emailed me a pattern to make fabric baskets last week. I am thinking of making some to accomodate some of my stash. Talking of storage, I have been taking pictures of the dining room as it's make-over is in progress. This has been a gradual process since Christmas but I think we will be paying a visit to the big blue and yellow shop in the next few weeks where I can get the last few bits and bobs I need. Hopefully I will have it all arranged how I want it soon, then I will give you a tour of my crafty space. In crochet-related sewing, I spent a happy few hours yesterday creating these little lovlies. I wanted to make one for myself and the other two are for presents. I used three fabrics from my Cath Kidston cotton duck stash for the exterior, with coordinating haberdashery fabrics for the lining. To make them, I used a tutorial from Joanne's blog; you can find it here. The tutorial is really well written with lots of pictures. I think it took me about three hours in total to make these. An enjoyable afternoon! The only thing I would change if making this again would be the needle pocket. My needles kept falling out when the roll was closed. Possibly this is due to me using cotton duck fabric and not the recommended quilting weight cotton (which also made the whole process rather trickier, why didn't I learn from the jewellery rolls I made?!) but the problem would be easily rectified by replacing the pocket with a piece of felt to keep the needles in. Today the boss has told me that I need to get on with the brick path that I am creating in the back garden out of our old kitchen wall. Better get on then. You'd better make that an extra large fabric basket for all that wool!! I really like Stylecraft's Special DK, glad I bought a bundle after reading so many reviews of it online, it's working out well.